Crank up your 2001-2010 GM model truck with Rough Country's 1.5-2in Torsion Bar Leveling Kit. 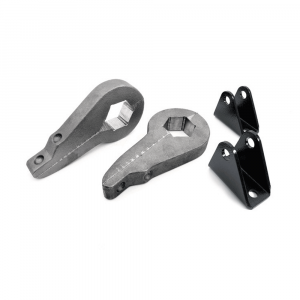 Featuring a set of durable, forged Torsion bar Keys and shock extension brackets, this kit affords you plenty of height without breaking the bank. Run up to a 285/75 R16 tire with this 1.5 - 2-inch Torsion Bar Kit. This setup levels the front of the vehicle with the rear for a killer stance and clean, level look.